BLURT GAME by educational Insights (ei-2917). Educational Insights is thrilled to be the new publisher of Blurt!, the world-famous word game that has sold over 1,000,000 copies! After being sold by the original publisher, Blurt! has been off the market for several years. Now it's back and better than ever with a cool new look and the classic game play that made it a platinum best seller! Think fast! What word means "a partially dried grape"? Be the first to say "raisin," and you're on your way to winning this riotous game of rapid word recall. Players take turns reading clues aloud, competing to blurt out the correct answer first and move ahead on the board. The first person or team to circle the board wins. Sounds simple, right? But as the race for the right word heats up, and the blurting gets boisterous, it's easy to get tongue-tied! 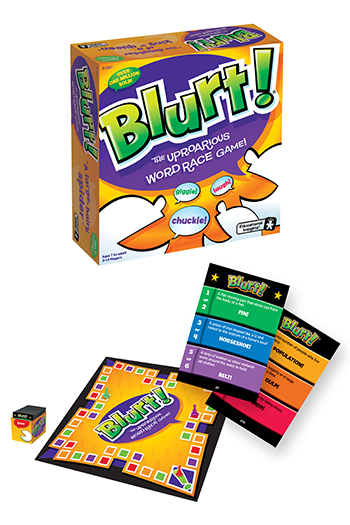 Blurt is a great vocabulary builder for kids, a hilarious addition to adult parties, and a must for family game night. Includes junior version for ages 7 to 9. For 3 to 12 players.